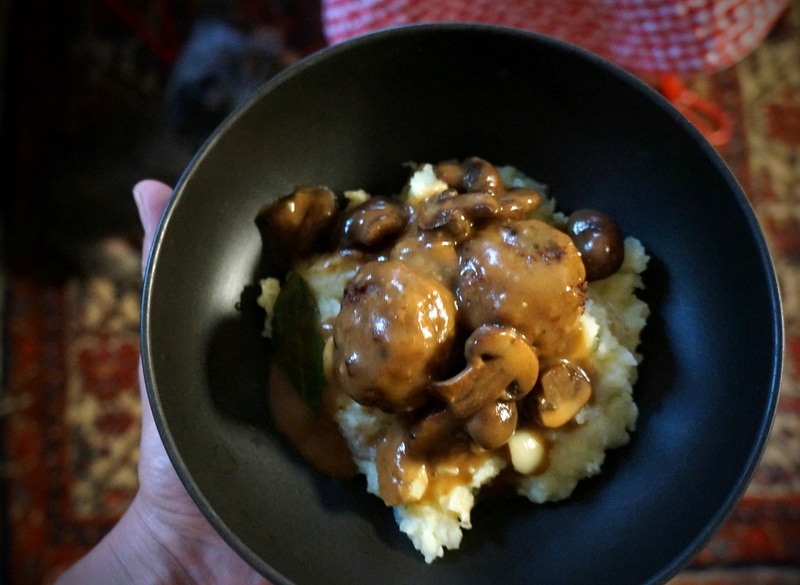 Meatballs in Mushroom Marsala Sauce are MMM… served over a billowy bed of buttery mashed potatoes, the ultimate comfort food. It tastes like something you’d get at an inn high atop the Swiss Alps. The meatballs alone are so rich in flavor and well worth the effort, but if you’re short on time, just grab a bag of ready-made ones from the store on your way home. Dinner will be on the table by the time you kick off your shoes. Peel and cut potatoes into big chunks. Collect in a pot and cover with water and a generous sprinkling of salt. Put the lid on and bring to a boil, then simmer 20 mins. Drain and return potatoes to the pot. Mash with butter, a splash of milk and season to taste. Spread evenly in an ovenproof dish and keep warm in the oven on low. Seed and dice bell pepper and add to a big bowl. Chop onions and mince garlic. Add them to the bowl. Add ground beef and breadcrumbs. Light beat the eggs and add to the bowl, along with the Worcestershire. Season with cracked black pepper and smoosh everything together. Shape tablespoons of the meat mixture into little balls and set onto a parchment-line baking sheet. Drizzle olive oil into a large pan set over medium-high heat. Fry meatballs in batches and place over the mashed potatoes in the oven. Melt butter in the same pan used to cook the meatballs. Slice and add mushrooms, cook til fragrant ~8 mins. Sprinkle in flour and stir to coat. in the wine and bring to a boil. Add broth and bring to a boil, again. Chop parsley and set aside. Remove meatballs and mashed potatoes from the oven. Spoon sauce over the lot evenly, garnish with parsley and serve! This recipe looks so delish! You come up with the best dinners. Love that it is a quick recipe! Oh my gosh, this recipe sounds so divine! I LOVE the way you describe the potatoes as billowy and buttery. I want to eat this comforting dish for sure! Bookmarking for sure. Dear Colette, we love meatballs, we love mashed potatoes, we love Marsala and a good comfort-style sauce – so this lovely recipe of yours is calling our name! What a fun post and what a fabulous recipe, my dear friend! Your meal is simple to prepare but oh so very comforting.